French fashion brand Hermès introduced its Rallye 24 collection of tableware last month in a Paris garage stocked with vintage sports cars. The Paris-based firm has a storied association with the world of automobiles: In 1923 Thierry’s grandson Émile-Maurice introduced a chic leather handbag dubbed the sac pour l’auto (still sold as the Bolide bag), as well as trunks to fit on the backs of Bugattis and slick chrome radiator caps. Inspired by this legacy of the world of motor racing, the new tableware re-imagines the classic chain d’ancre design as a race car track. 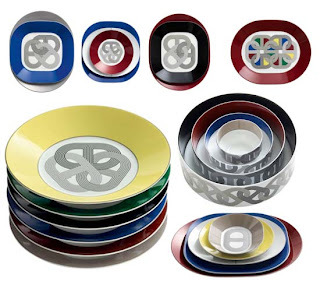 The 49-piece collection of jewel-colored porcelain has a pattern of ellipses reminiscent of speedways. The rich colors evoke old international racing liveries, like Italian red, French blue, German silver and British green. Rallye 24 reflects the sporting life, Hermès’s theme for 2013. The dishes will be available by the end of March. Prices range from £86 for a tumbler to £423 for an oval platter. The set of six round plates shown here is £753. Hermès also recently released a Circuit 24 wallpaper and is slated to add table linens based on the motif later this year.